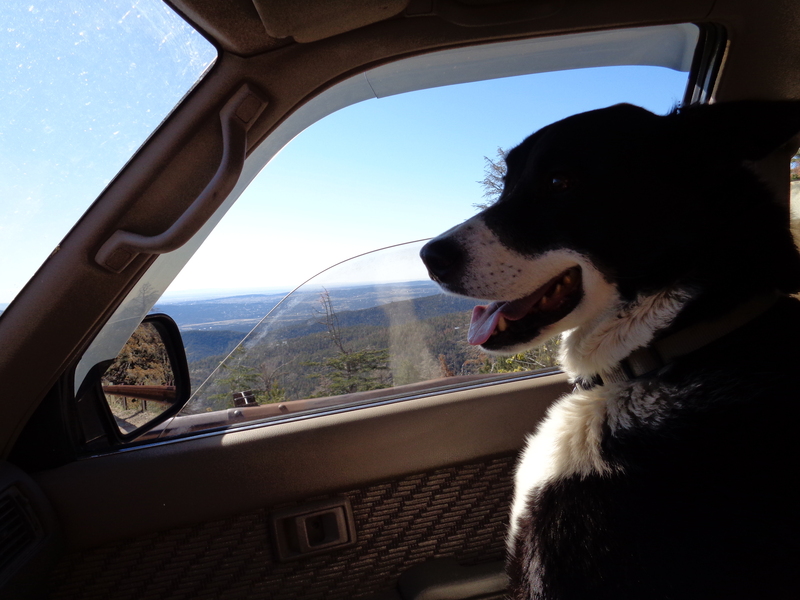 We set out early in the morning, with Harold in the front seat, the pups in the back, a cooler of snacks and a decent map. I love the Benchmark Maps by the way, talk about detail! The NM recreation and road atlas is a full size page turning adventure, better than most novels I read. We took Highway 14 south and then headed up into the Sandia Mountains, taking the dirt road through the Cibola National Forest on NF165. I’ve once driven it in a snow storm which I don’t recommend as the road hugs the side of an incredibly steep drop off, gravel roads make the surface slippery, and the views tempt you to stare off into the void. I had to pull over. 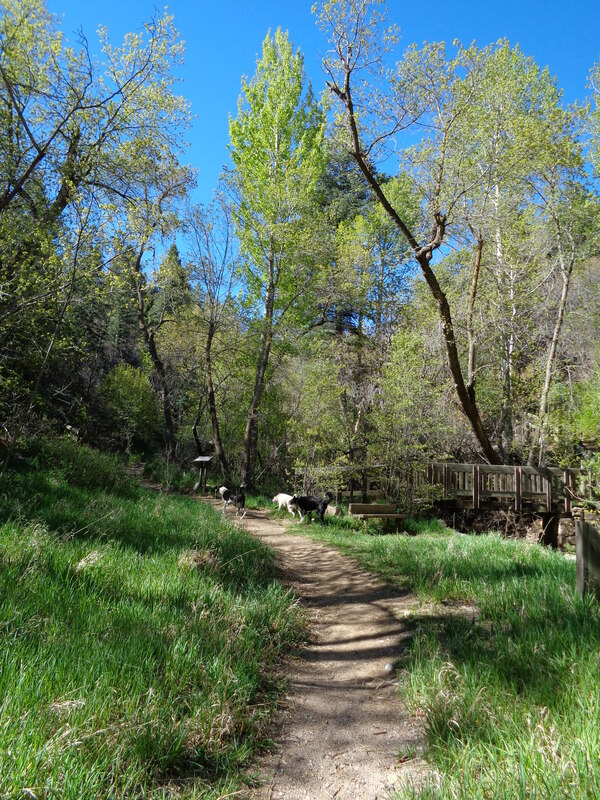 The Las Huertas picnic grounds weren’t officially open but parking out of the way, we hiked up the trail and they drank from the rushing creek. Quiet and dense forest surrounded us and I felt the last few weeks of tension drain away. The dogs all listened, played and their own tensions disappeared. I stopped in Placitas for a coffee and hoped for a burrito but left with a warm dried out scone instead. I threw it out after eating only half. 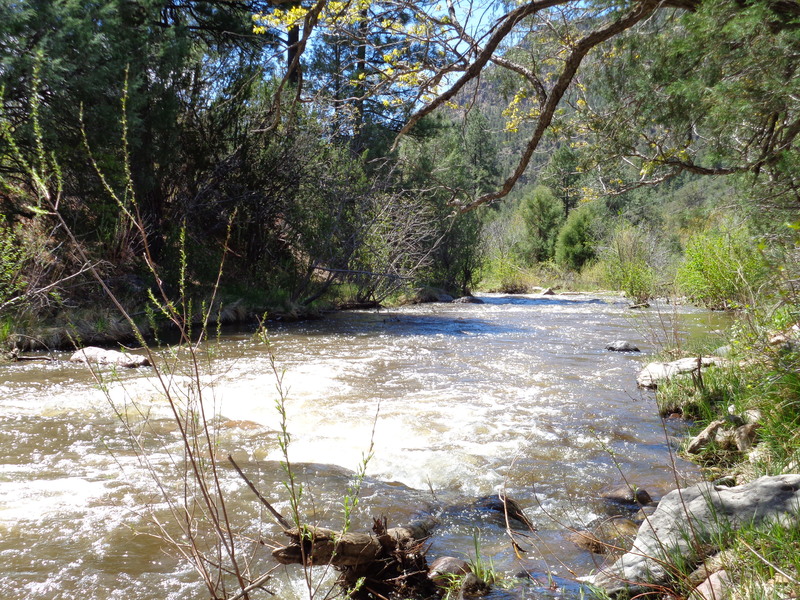 We drove onto Hwy 550 and took a right into the Jemez Mtns at San Ysidro and Hwy 4. I had found a network of NF dirt roads to explore before heading to the wedding in the Valle Caldera. The signs worried me when i turned onto NF 376. 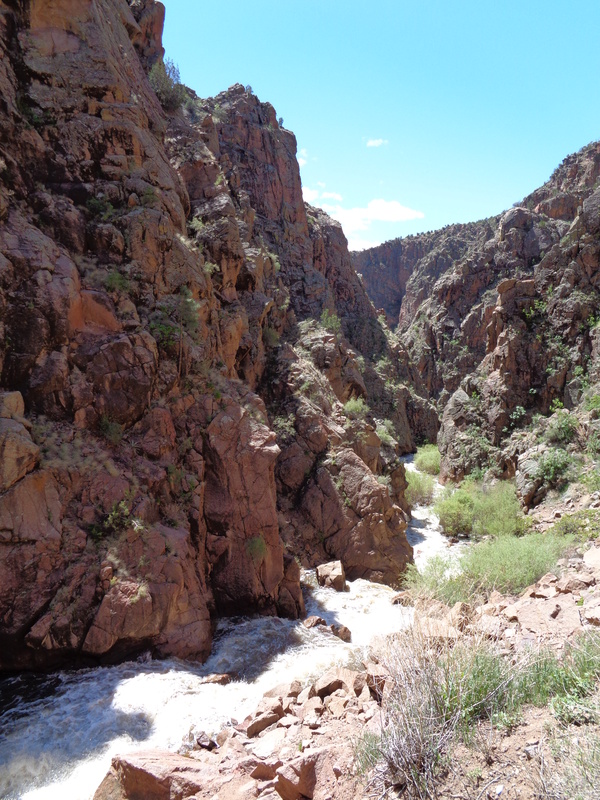 Within a few miles the road turned to gravel and the canyon narrowed. Through a tunnel the sound of a waterfall stopped me. I climbed out but left the dogs inside, just a photo op as the road was surprisingly busy but it was a Sunday after all. 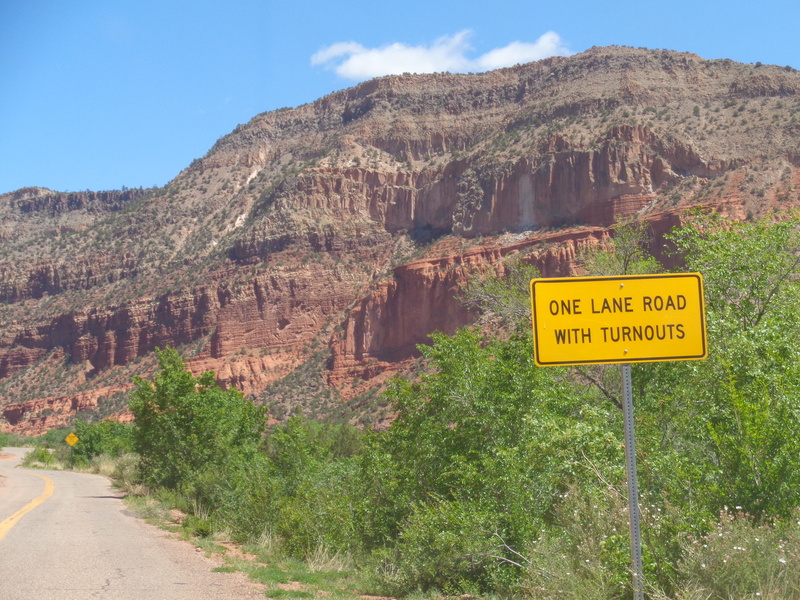 The road became steep with washboard gravel, dropping off into the deep canyon but then after a few miles the forest service had set up numerous dispersed campsites with parking off the road and footpaths to the river below. I fell in love. This is where I want to bring Pete and Anita when they visit in a few weeks. The red rocks above, the groves of old oak and cedar, the water racing by, the firepits, the smell of the heat on the vegetation, and rustic tent sites reminded me of Spain. We stopped for lunch and the dogs roamed freely. Rosie swam, Ollie chased her and Harold stayed close to me. The usual river rituals for all. 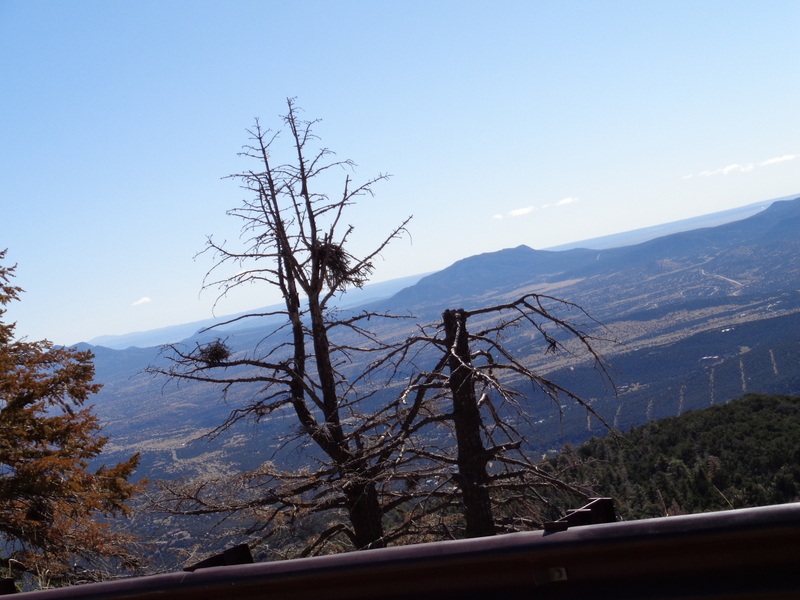 We carried on up the road into the unknown and the number of other cars dropped off dramatically as the road steepened and we drove further away from Jemez and even Albuquerque. The valley opened up into meadows, creeks and aspen trees. 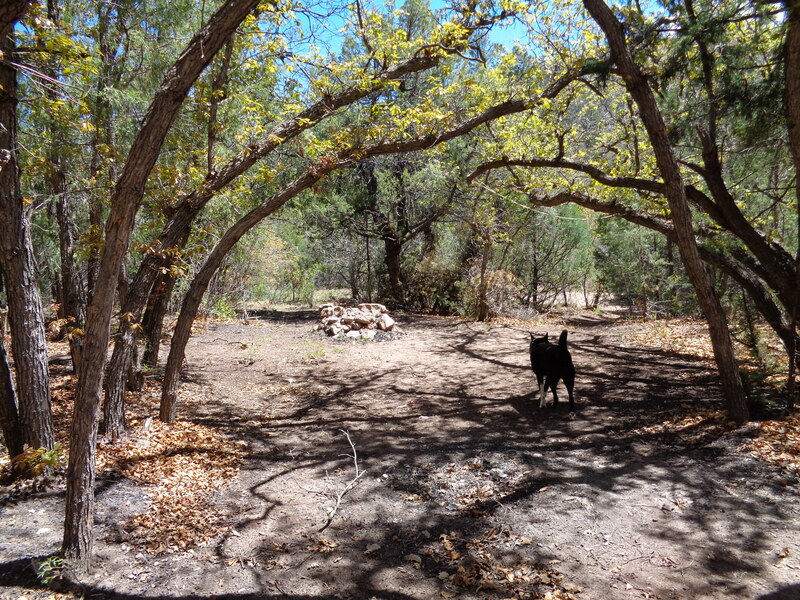 These campsites appealed too, open and spacious with grass, places to pull up next to tents and firepits. Perhaps then this is where we’ll come back with my brother? The next hour passed quickly and I had to shift gears so to speak. A wedding called me. I didn’t linger but instead we drove, parked occasionally and noted the other NF roads to explore on another visit. 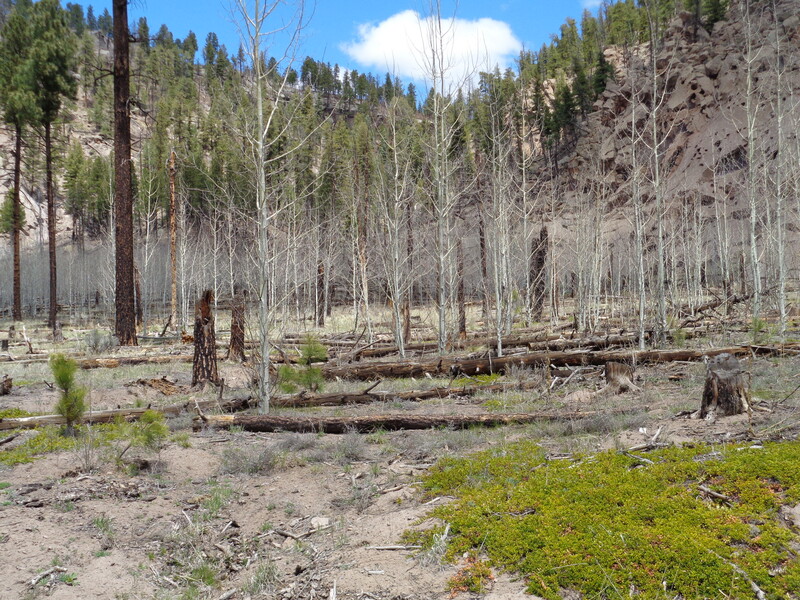 The devastation from the wildfires became more apparent the higher the elevation. We arrived out on Hwy 126, left towards Fenton Lake and right towards La Cuerva. 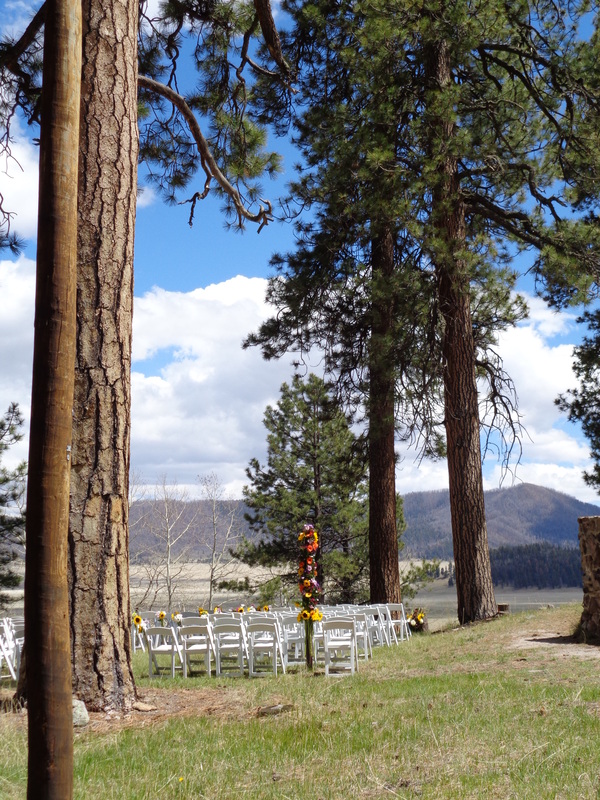 Time being limited, I headed to La Cuerva and the wedding in the Valle Caldera. I’ll be back though.